← Grilled Pizza ALACARTE ! I am dying to try this…but I may be only able to find the 190 proof. Would it be better to just use all vodka? Yes, it will be fine to use all vodka. Keep us posted! Wow! just a perfect recipe! I just finished the last step of my batch! It is now cooling for Christmas gifts! AWESOME idea thank you! So glad to hear you love the recipe… and what a perfect way to spread some Christmas cheer this holiday season! I have those same glasses! This recipe looks fantastic. The one I’ve been using only calls for about a dozen lemons. 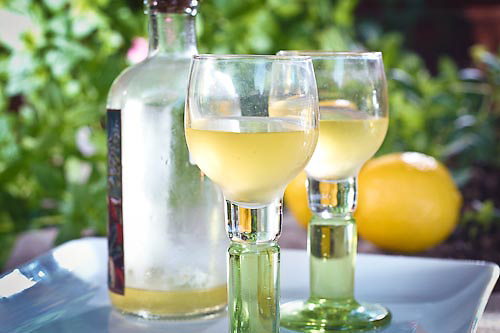 Please let us know if you make the Limoncello….we have had lots of readers tell us they are giving this a try. The glasses were the same ones they serve Limoncello in at Sonny’s on the Avenue. In fact, the picture was taken there, on their outdoor patio. I will get started soon! This sounds delicious and even looks enchanting in the sunlight-beautiful! Now you know why we love shooting in daylight….and let us know how it goes with your batch of Limoncello! I must try this soon. My MIL buys crema de limoncello in Lidl (spain) which she enjoys very much, quite something for a woman who has never drunk alcohol! Thanks for your comment. Let us know if you brew a batch of Alyssa’s Limoncello! Ah! Limoncello! It reminds me of being on the Amalfi coast. That frosty bottle – boy, did this post hit the spot!